ReallyRocketScience is going to be taking a bit of a break over the Holidays, but we’ll see you all back here bright and early on Tuesday, January 2nd, nursing our lingering hangovers, and still wondering what happened the evening before last. In all seriousness, whatever you celebrate (and even if you’re celebrating nothing in particular), best wishes to you and yours for a happy and safe holiday season. See you in 2007! An "energetic" storm on the sun disrupted signals in space and forced mission controllers to shut systems down to avoid damage to spacecraft orbiting Earth, the European Space Agency said. The flare was the strongest of five categories for such ejections and was one of a series of eruptions this week that emanated from a region of active sunspots. 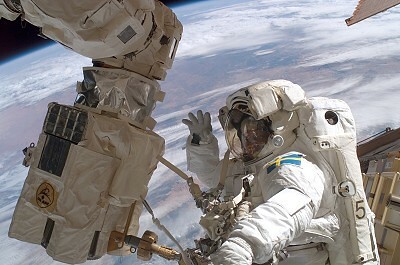 It may also have caused a fault in the system controlling the space station’s orientation in space. The ISS usually relies on four large gyroscopes that spin to control its "attitude" without consuming copious amounts of propellant. Space station flight director Joel Montalbano told reporters in Houston, US, that the unusual solar activity had caused the density of Earth’s atmosphere to increase. "We’re seeing some problems with our software converging on a nice stable attitude for attitude control," Space.com quoted him as saying. 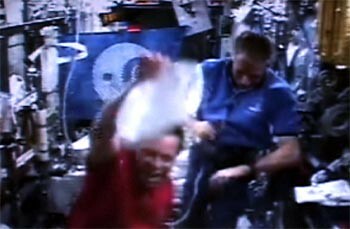 Last week, astronauts were forced to sleep in protective areas of the station and shuttle as a precaution against the storm. What do satellite operators like SES AMERICOM do in a case like this? Nothing, really, other than ride it out. But all that solar activity can be beautiful. The image at the top of this post is from NASA’s twin Solar Terrestrial Relations Observatories (STEREO), which sent back their first images of the sun ‘s growing activity. And some musicians at Berkeley are even making music inspired by "the breeze of electrons from the sun." Zamfir, eat your heart out. But as beautiful as the images of the sun are from last week, some impatient people may wonder what the sun looks like right now. For that, bookmark SolarMonitor.org, which provides nearly real time images of the sun. Is time running backwards, or are music lovers just getting back to their roots? Rhythm and Blues replace XM’s original satellites, "Rock" and "Roll," launched in 2001, which will serve as in-orbit spares for the near-term. "Rock" and "Roll" were just launched in 2001 — so why replace them so soon? The first Boeing 702 spacecraft had problems with the solar arrays, which experienced "faster than expected performance degradation during early operational life." That’s a mere euphemism, insurers say. In a satellite version of a "lemon law," the world’s "largest space-insurance underwriters have agreed to seek damages from Boeing Co. for what they allege was gross negligence in the manufacturing of the first six Boeing 702-class satellites, all of which had defective solar arrays," according to Space News. In 1997, scientists and engineers of the Photovoltaic and Space Environments Branch of the NASA Lewis Research Center, Maxwell Technologies, and Space Systems/Loral discovered a new failure mechanism for solar arrays on communications satellites in orbit. Sustained electrical arcs, initiated by the space plasma and powered by the solar arrays themselves, were found to have destroyed solar array substrates on some Space Systems/Loral satellites, leading to array failure. The mechanism was tested at Lewis, and mitigation strategies were developed to prevent such disastrous occurrences on-orbit in the future. Not all problems lead to array failure, however. But maintaining the functionality of solar arrays remains one of the key challenges to satellite engineers working in a difficult environment. Say that three times fast, eh? We’ve written before about the challenges of bringing broadband access to remote, rural regions of Canada (in communities like Black Tickle, Labrador) — and the resulting lack of Internet access options for rural residents in the north. Saskatchewan Communications Network (SCN) Minister Glenn Hagel and OmniGlobe Networks, Inc. (OGN) Chair Julian Costley today signed a Memorandum of Understanding to form a long-term strategic alliance. The two companies will work together to deliver a satellite-based wireless broadband Internet service capable of supporting video-conferencing, Voice over Internet Protocol (VoIP) and other e-solutions to rural and remote communities across Canada…. Earlier this year, SCN and OGN undertook a six-month project together to deliver wireless broadband Internet service to several remote communities in northern Quebec. The success of the Quebec project demonstrated large-scale interest for a national service combining satellite with terrestrial wireless access, inspiring the two organizations to jointly extend the model across Canada. Omniglobe has years of experience delivering VSAT services (such as distant learning) to rural Canada. But delivering true broadband to Canada is going to require far more spectrum (bandwidth) then VSAT. Where will that spectrum come from? On November 15, the Ciel Satellite Group filed nine applications with Industry Canada for multiple satellite orbital positions across several frequencies. The applications were submitted in response to Industry Canada’s Call for Applications to License Satellite Orbital Positions, the largest in Canadian history. Applicants who are awarded licences from the Call will have the opportunity to build and launch satellites to bring new spectrum into use for DTH, HD and broadband services, for the benefit of Canadians in all regions of the country…. David Lewis, President and CEO of Ciel, noted, "This is a key event in Ciel’s history and, at the same time, a defining moment in the history of Canadian telecommunications." Let it never be said that you don’t get all the angles on space travel and rocketry here on the Really Rocket Science blog. Oh sure, I could tell you about Japan’s launch this afternoon of the country’s largest satellite ever, but you’d much rather know about Yoga’s history in space, right? I thought so. "Prime Minister Jawaharlal Nehru of India, obviously prompted by cold-war worries, denied reports that his nation would supply the Soviet Union with yogis to help cosmonauts breathe easier in outer space." While yogi’s might have never made it to Mother Russia, Yoga did make it into outer-space (and on a Russian mission, no less) when Rakesh Sharma, who some have recently rumored is being considered for a second trip into space, became the first Indian in space in 1984. During the spring flight aboard the Soviet Soyuz T-11, Sharma often did a somewhat elaborate series of zero-gravity Yoga exercises, marking the first extraterrestrial practice of the asanas (postures). Ever since, there has been great interest in the potential benefits in stress relief, breathing, and circulation Yoga could bring to space travel in the future. Moral of the story? If you’re thinking about hoping a trip on the Virgin Galactic-1 or one of the other opportunities for space travel that might come afterwards, maybe you should start thinking about picking up a matt and heading off to your your local Yoga center while you wait. CFRA newsradio read the Wall Street Journal this morning and announced Loral and PSP were buying Telesat from BCE. 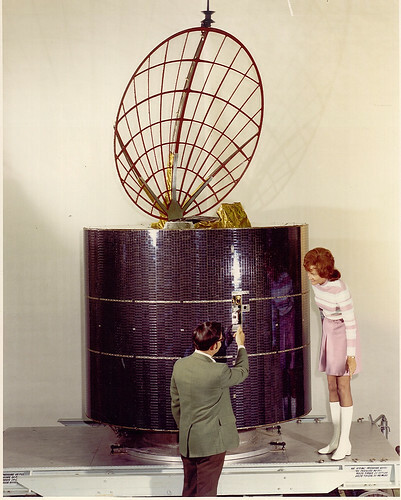 Telesat was the first domestic satellite operator (Anik A, pictured below, was the first satellite). Loral Space & Communications Inc., in partnership with a Canadian pension fund, is expected today to announce a deal to acquire the Telesat satellite unit of Canada’s BCE Inc. for more than three billion Canadian dollars (US$2.59 billion), according to people familiar with the details. As part of the transaction, Loral will contribute cash as well as all of its own satellite assets to form a new company, based in Canada, that will own and operate the combined satellite fleet, these people said. The structure is intended to create the fourth-largest global commercial fixed-satellite operator, with 11 satellites in orbit and four more under construction, while complying with Canadian laws restricting foreign ownership of such firms. A Loral spokesman declined to comment, as did a spokesman for Telesat. It was unclear which pension fund was participating in the deal. The combined company would have an order backlog of more than C$5 billion for leasing in-orbit capacity to customers who use it to transmit video and data for applications ranging from television service to Internet connections. For the first nine months of this year, Telesat reported revenue of C$351 million. By combining Telesat’s existing coverage over North America with Loral’s international business and longstanding ties to large customers and other operators, the new entity would be designed to compete more effectively against global satellite behemoths such as Intelsat Ltd. and SES Global SA of Luxembourg. A deal would pave the way for BCE to follow its strategic plan to exit the satellite business. And the pension fund will have two-thirds of the voting rights in the new entity, the people familiar with the matter said. But Loral, which also had been toying with the idea of bailing out of what is known as the satellite-services sector, is expected to have control over two-thirds of the economic assets, these people said. Loral’s satellite-manufacturing business won’t be affected. Consolidation among smaller satellite operators has picked up momentum following a spate of larger acquisitions over the past few years. Daniel Goldberg, who became president and chief executive of Telesat in September, will become chief executive of the newly formed company. Since the summer, BCE has been weighing an initial public offering of the unit in the U.S. and also inviting alternative bids from private-equity groups and others. Loral took part in the auction despite comments from Chief Executive Michael Targoff earlier this year that the New York company was considering exiting the segment because its fleet was too small to compete against larger global rivals. Private-equity groups have invested nearly US$10 billion in various satellite-related acquisitions and mergers over the past few years, pledging to reduce capital expenditures and improve profitability. But the latest deal signals that the next industry trend may feature consolidation among regional and second-tier and third-tier operators, hoping to gain size and coverage to compete with global rivals.